The Dutch Safety Board leading the investigation into Malaysia Airlines Flight MH17 say the aircraft was brought down by 'high-energy objects' penetrating the cockpit and front of the Boeing 777-200. The preliminary report of 34 pages was released yesterday, though it was not accompanied by any supporting materials like audio files of the voice recorder black box or satellite data. The initial findings appear to rule out conclusively that MH17 came to an abrupt end over Eastern Ukraine killing all 298 on board due to technical malfunctions or pilot error. According to the information received from Malaysia Airlines the crew was properly licensed and had valid medical certificates to conduct the flight. According to the documents, the aircraft was in an airworthy condition at departure from Amsterdam Airport Schiphol, there were no known technical malfunctions. No aural alerts or warnings of aircraft system malfunctions were heard on the Cockpit Voice Recorder. The communication between the flight crew members gave no indication of any malfunction or emergency prior to the occurrence. 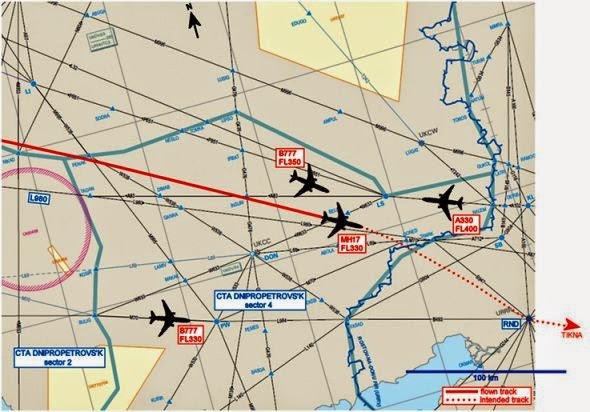 At the time of the occurrence, flight MH17 was flying at FL330 in unrestricted airspace of the Dnipropetrovs’k (UKDV) FIR in the eastern part of the Ukraine, the aircraft flew on a constant heading, speed and altitude when the Flight Data Recording ended. UkSATSE had issued NOTAMs that restricted access to the airspace below FL320. The last radio transmission made by the crew began at 13.19:56 hrs and ended at 13.19:59 hrs. MH17 began at 13.20:00 hrs and ended at 13.22:02 hrs. The crew did not respond to these transmissions. No distress messages were received by the ATC. According to radar data three commercial aircraft were in the same Control Area as flight MH17 at the time of the occurrence. All were under control of Dnipro Radar. At 13.20 hrs the distance between the closest aircraft and MH17 was approximately 30 km. However, beyond this, the report tells us little more about what happened MH17 or anything about the how, why and who was responsible for the multiple high-energy objects which resulted in the mid-air break-up of the aircraft. The Dutch Safety did make it clear last week that the preliminary report would not attempt to attribute blame and considerable work still remained on an investigation not expected to deliver its final report, conclusions and recommendations until next summer. Indeed, despite headlines and coverage in the media following publication, the report never mentions the word missile, nor does it mention the phrase shot down, and it does not categorically prove that MH17 was downed by a BUK missile, as some news reports have suggested. While the complex nature of this investigation and the conflict in Ukraine together with the current geo-political climate continue to present huge challenges, the Dutch Safety Board may have been wiser to present the actual audio of the flight voice recorded, considering it provides no clues as to what transpired at 13.20 (GMT) on July 17th. "On 18 July 2014 around 06.00 hrs the National Bureau of Air Accident Investigation of Ukraine (NBAAI) sent a notification that on 17 July 2014, at 13.20 hrs, a Boeing 777-200 with registration 9M-MRD of Malaysia Airlines disappeared to the west of TAMAK waypoint. The NBAAI was notified by the Ukrainian State Air Traffic Service Enterprise (UkSATSE) that communication with the flight crew had been lost. A signal from the aircraft’s Emergency Locator Transmitter (ELT) had been received and its approximate position had been determined." It is also notable that there appears to be a 17 hour period before the NBAAI formally notified by UkSATSE. Of course this may also be attributed the circumstances and the fact the aircraft had been brought down in a war zone. The radar information used does not make any reference to Russia's claims of a Ukraine fighter jet present in the area at the time MH17 disappeared from ATC radar. My suspicion is that the Dutch Safety Board are in possession of a great deal more information, as yet not fully verified, or they are still awaiting the release of information. Let's hope the current ceasefire in Eastern Ukraine holds and investigators can get boots back on the ground as soon as possible. 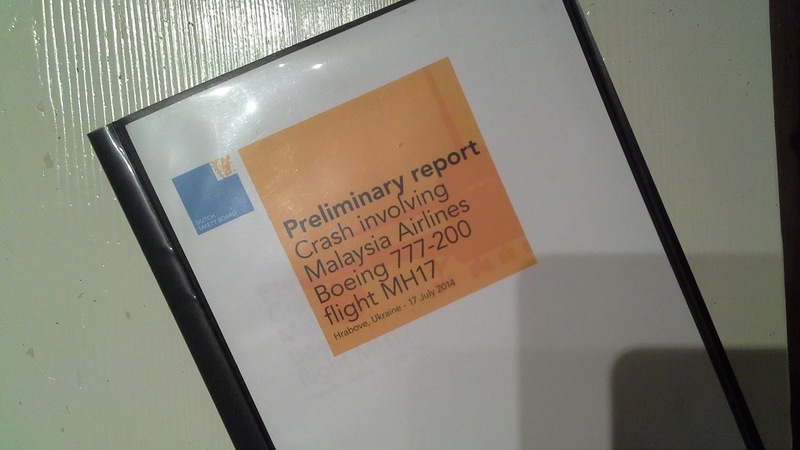 Below, Crash MH17 - Chairman Tjibbe Joustra, talks about the initial summary findings of the preliminary report.